Kuno trained young German Shepherd Male for sale is a super combination of two totally unrelated bloodlines. No line breeding in this pedigree! 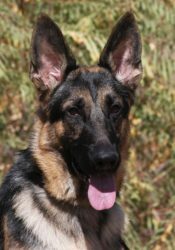 He has a very friendly disposition and is a large German Shepherd male with strong bone and head. Kuno is very open and social with everybody he meets. He has great desire to interact and learn, which makes training very easy. He is build exactly how a German Shepherd should be structured. Coming from a an all West German bloodline of the Sire: Sven vom Zauberberg and Dam: Angel von der Quadriga, he is very well build and easily trained.